Hiya guys. I've had a very long couple of days and unfortunately the situation has not been resolved. This means a lot more anxiety for me so I don't know how active I will be. I'm trying to remain positive, but it's a constant struggle. While I deal with everything, one thing in my life that can cheer me up is having my nail time. 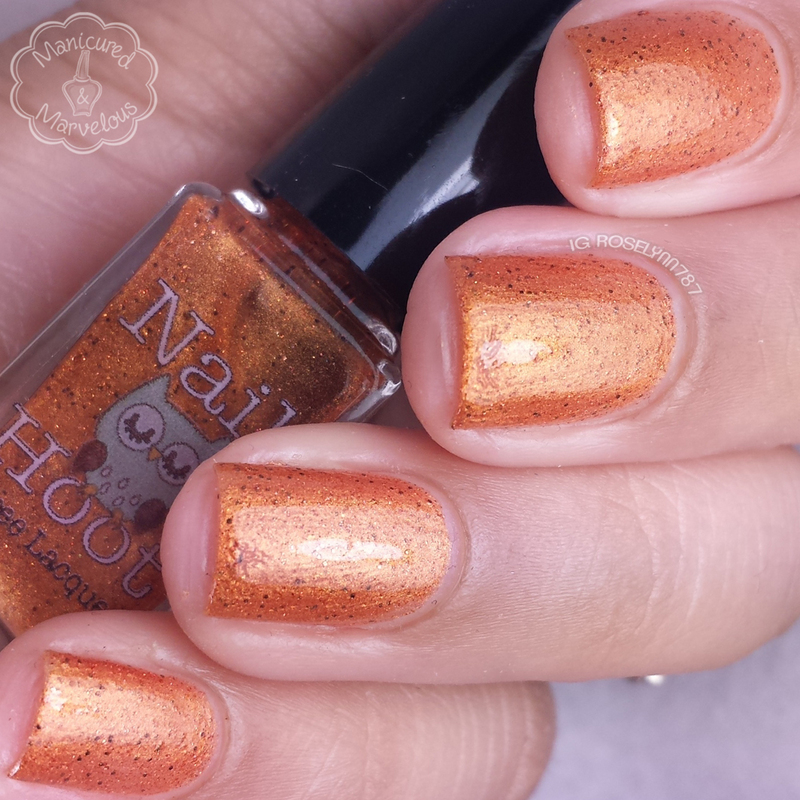 Today I'll be sharing swatches for a relatively new indie on the block Nail Hoot Lacquer. This collection is the second one released from this indie and it is inspired by characters from the popular kid's board game Candy Land. 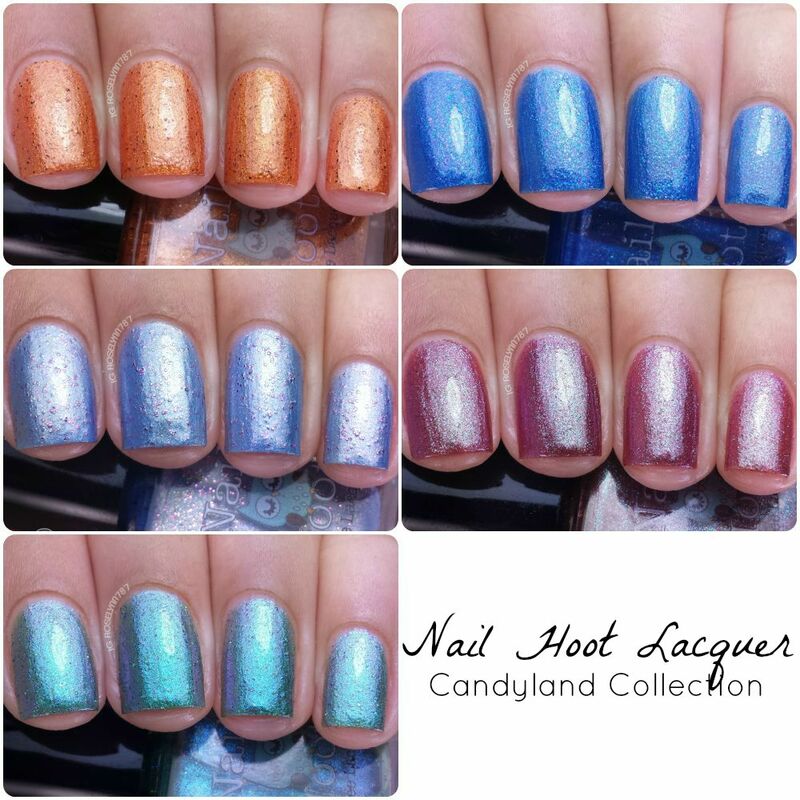 The Candy Land Collection by Nail Hoot Lacquer is available for purchase in mini and full sets, as well as, individually. Each full size bottle retails for only $6.50! Kandy Krunch can be described as a burnt copper orange polish filed with fiery micro glitters and larger orange and brown glitters. This polish is inspired by the character "King Kandy". The base ends up having a hint of shimmer and a metallic feel. While I don't care for this type of shimmer base, in this particular polish I think it adds a nice touch. I cannot stop thinking of a peanut butter cup whenever I see this one, my hubs thought I was crazy haha. Formula was sheer on the first coat, but builds to an opaque finish by the third layer. The end result looks a little gritty, but it does have a smooth finish before topcoat. Shown here is three thin coats sealed with a thick layer of Seche Vite topcoat. Licorice Twist can be described as a chocolate-mauve polish with flashes of blue and multiple micro glitters. This color is inspired by the character "Lord Licorice". One of my favorites in this collection, this polish truly feels so unique and beautiful to wear. Really wasn't expecting to like this one as much, but it was such a pleasant surprise. Formula was more opaque than I expected as well and had a very smooth application throughout. You do have to be careful with the brush strokes, because rough ones will be highly visible due to the shimmer. Shown here is two coats and sealed with Seche Vite. My Green Plum This is a beautiful green polish that flashes blue and purple. It is filled with micro glitters for added sparkle and shine. This polish is inspired by the character "Plumpy". That color shift says it all, doesn't it? Freaking gorgeous! Now it does look gritty due to the metallic shimmer base and glitters combination, but it is not a texture finish. Again, with this one it just looks so unique and fun. Formula and consistency work well and have a smooth application. I love that the glitters are well spread and don't clump in one area. Shown here in three coats and sealed with Seche Vite topcoat. 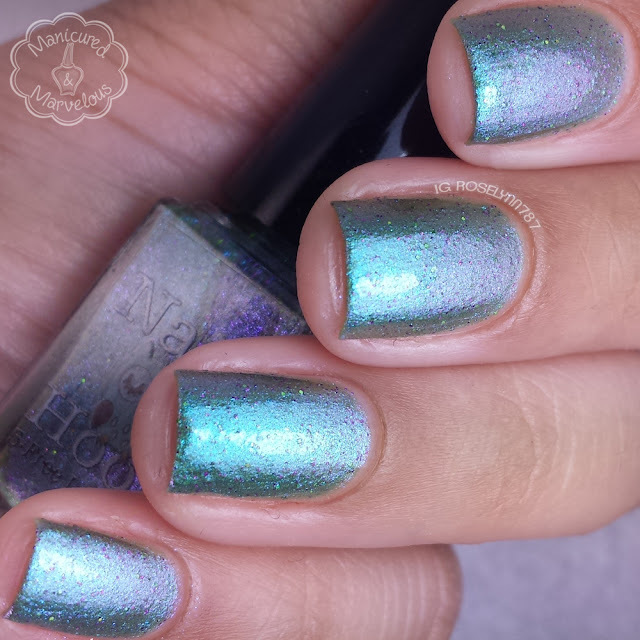 Ice Queen is a light purple polish with small pink glitters dispersed throughout. It appears to be icy blue in some lights and purple in others. It is inspired by the character "Queen Frostine". Sometimes I'll feel certain colors with a metallic base just don't mesh well and this is one of those times. Although I'm sure some of you ladies might like it, it's not my personal cup of tea. The formula is sheer on the first coat and the brush strokes are very evident in the metallic finish. 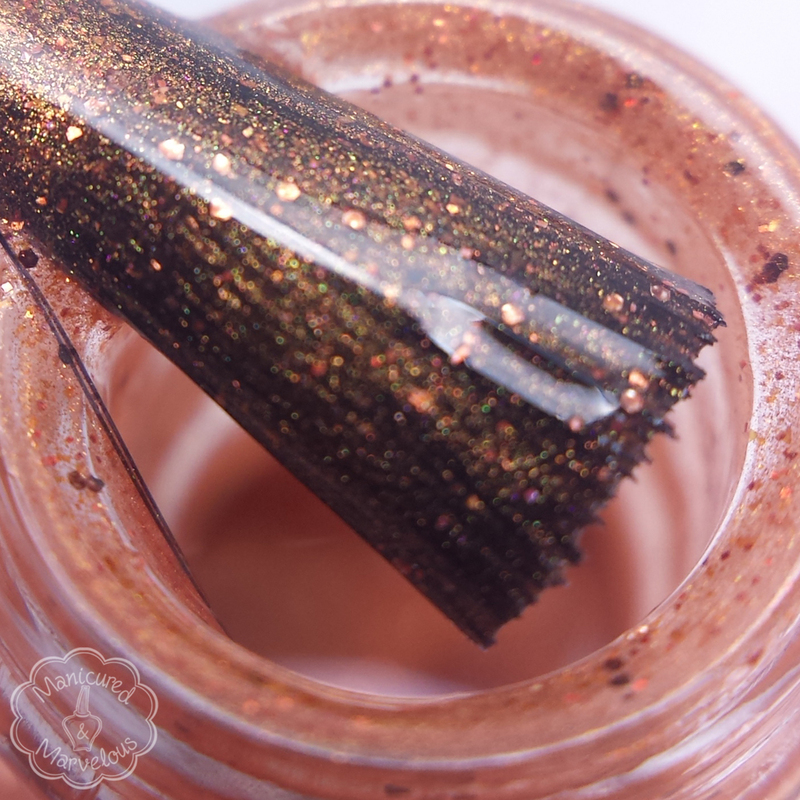 The glitter to color combination make it look really textured, but it's a smooth finish. Shown here in two coats and sealed with Seche Vite topcoat. Gramma Sparkle Berry can be described as a true blue polish that is filled with purple and turquoise micro sparkles. It is inspired by the character "Gramma Nutt". Definitely have to mark this one off as a must-have! Such a gorgeous color and the combination really adds a beautiful level of dimension. Formula is the best from the set and applies very smoothly without any issues. It's also very opaque on the first coat, but again you'll see it look a bit textured when dry. There is, however, no texture to the actual finish. Shown here in two coats and sealed with Seche Vite topcoat. Overall it's an interesting collection with a nice range of shades and some unique combinations. It's really dependent on your take with metallic/shimmer finishes. Obviously it can be a hit or miss, but some of these are a ball park hit like Gramma Sparkle Berry. For a brand new indie, Nail Hoot Lacquer has definitely struck up some unique polishes that make me curious and excited to see what the future holds. Which one of these is your favorite? 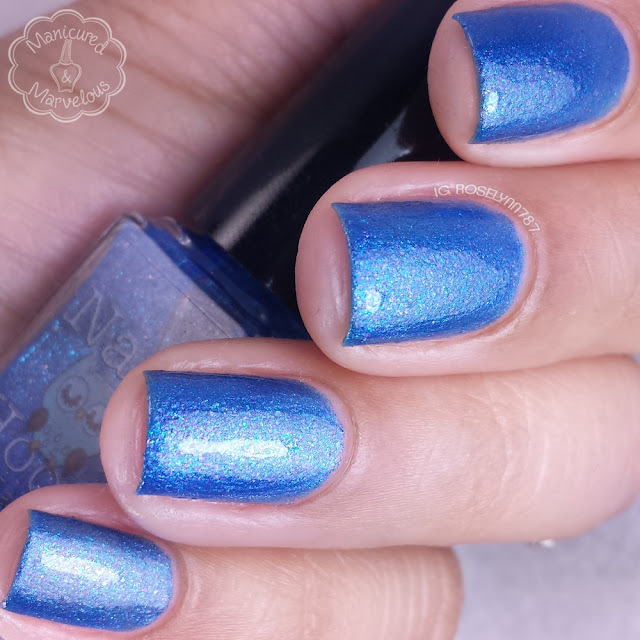 Be sure to check out Nail Hoot Lacquer on social media for the latest shop information and possible sales! I totally see the peanut butter cup reference. Haha yay I'm not the only one! Oooooo My Green Plum is beautiful and I love the name! Isn't it though?! The color shifts are so much more impressive in the sun. I absolutely love My Green Plum!! It's definitely a fan favorite! I'm not a fan of this type of finish this on myself but they look amazing on you! These colors are super pretty! I'm not a fan of the finish on myself but they look awesome on you! They really do look like candy, too! Yes I agree! Brandie totally nailed the inspiration for these polishes. You did an awesome job - thank you!! Thank you so much! Working with you has been a fantastic experience. Interesting polishes, new brand name for me..
Definitely check them out. New brands have been popping up left and right so it's hard to keep up. So sorry you have been feeling anxious! Your macro of these are just amazing. Loving Gramma! Hope things settle for you soon. My Green Plum is a really interesting polish! I like Gramma Sparkle Berry, too. I'm digging My Green Plum! Me too! It has so much depth! Such amazing macros. I loved Gramma sparkle berry most. Kandy Krunch is my favourite of the bunch. I guess I have a crush on oranges or similar shades lately! I've been excited to see swatches of this collection since I heard abou, and I'm glad to see yours! You make them look so smooth! I like the duochrome glitters in some of these- it really adds something special. The shimmery metallic bases + glitter aren't for me, but Gramma Sparkle Berry looks pretty nice! Gramma Sparkle Berry is so pretty! I hope things work out for you soon!